The task at hand is a decent size apartment in one of the most dynamic cities of the Netherlands. The main characters are the first time owner keen on moving in as soon as possible, the architect, the builders, the electrician and a few others. The context is a not so old building, but truly and honestly plain which compensates through a good location. • Surface wise is not the biggest apartment, but it is enough to offer an array of options. It’s biggest issue is the lack of storage options and that will be the item that will require most imagination. • It’s layout presents nothing big to sort or modify. There is a primary hallway allowing access to all the main spaces and there are no wasted spaces. • The bathroom and the toilet are on the small side. 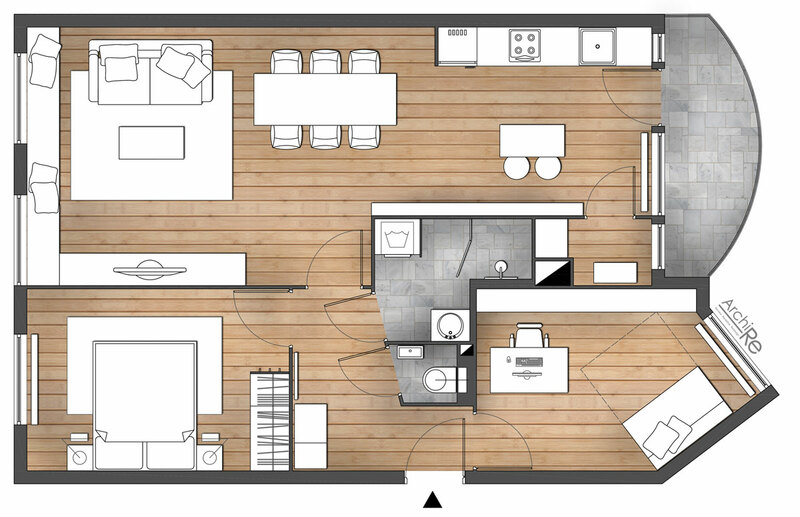 The layout of the apartment forces the placement of the washing machine in the bathroom, which is not something I’m fond of. But hey, is a better option that having it in the storage/technical space across the kitchen. Why? Haven’t you been paying attention? OK, I’ll give you a hint. Dragging dirty clothes and laundry baskets through the living room. • The living room is of a decent size and has a beautiful orientation towards the south on the balcony side. Love that! Design: • Layout wise, there is not a lot of unexpected in this project. The bedrooms are small so I did the best I could with the wishes of the owner. I built the master bedroom around a 1.60m wide bed which left little circulation space around it. I placed the closets next to the door as it, literally, was the only option. Placing a bed with the long side next to a wall is not an option in a master bedroom. It is a matter of necessary comfort and elegance to have two nightstands. • The small bedroom has been laid out as an office with guest room option. The shape of the room and the placement of the window made it difficult to find the right placement of both the desk and the extendable couch. A desk should be facing facing the door or at least have a side view of it. I have previously explained that people really don’t like the feeling of uncertainty, even in their own house. However, neither having a window behind the desk (unless in an office building) is a desirable option. This resulted in the placement of the couch next to the window and the certainty that the computer screen will not suffer from the proximity of the window. • The toilet is small and uneventful. Changes were done only in regard to materials and furniture design. The bathroom suffered the same faith. Small and quite cramped, it left little to play with in terms of layout. Finishing materials and furniture wise… well, that’s a different story. • The living room and kitchen space is the largest of all. Obviously! It was very important that the first element to be seen as one entered the room to be a complete one and not just a small piece of it. The dining table is an element easily understood so seeing the middle of the table provides that sensation of a full element, despite part of it being initially hidden from view. The sitting area is simple and it takes advantage of the two large windows. However that will be obvious when furniture is finally completed. The kitchen preserves the old layout but is livened by the addition of a full wall wine rack and a kitchen island. Can’t wait to get to the point of actually making the wine rack wall! There is still so much more to be done in this project. We’re only at the level of installing floors. The process is exhilarating, stressful and absolutely amazing all in the same time. I love my job!